Sustainability author, L. Hunter Lovins, newest publication debuted October 9th, 2018. This book presents a blueprint for how you can help create a regenerative economy, one that delivers shared prosperity on a healthy planet. 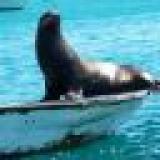 Hunter is an Advisor to http://www.earthprotect.tv and her nonprofit, Natural Capitalism Solutions, is a participating nonprofit. Humanity is in a horse race with catastrophe. Charting a course to a regenerative future is the most important work before us. A Finer Future assembles the evidence that we can divert from the road to collapse, and together craft a world that works for 100% of humanity. It shows how you can rally communities, companies and countries to create an economy in service to life. It demonstrates how to transform finance, corporations, agriculture and energy to enhance wellbeing and restore trust and social capital. It describes the changes to the nature of work needed to address income inequality and environmental destruction. Using references and case studies of solutions now emerging around the world, it outlines the principles of a regenerative economy and details the policies needed to achieve it. 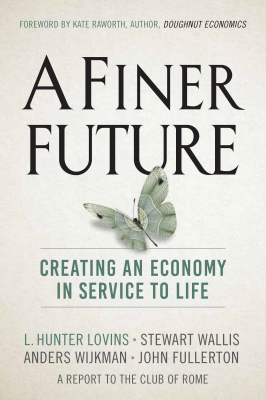 ‘A Finer Future' is a work of refined synthesis and insightful visioning. Rooted in a stark analysis of current development trends its authors rapidly move beyond critique to developing an inspiring yet deeply practical narrative about transitioning to a regenerative economy. More than a guide or blueprint - it is an enlightened, pragmatic and empowering roadmap through life as we know it, the choices we make and the future we want. L. Hunter Lovins, Time Magazine’s Millennium Hero for the Planet, is a business professor, President and Founder of Natural Capitalism Solutions, and co-author of the best-selling Natural Capitalism. Stewart Wallis was Executive Director of the New Economics Foundation, UK, and advises the World Economic Forum. Anders Wijkman is Co-Chair of the Club of Rome, a former EU parliamentarian, and co-author of Bankrupting Nature and Come On! John Fullerton is President of Capital Institute and former Managing Director at JP Morgan. Publicist, "A Finer Future: Creating an Economy in Service to Life"